We've been working on a simple tool to help use migrate websites from one environment to another. Now, although there are a LOT of tools out there, none quite fit our needs, so we built one!! Introducing CMS Move! A simple to to help you migrate your site. We've been working with the tool for our ExpressionEngine, Craft CMS and Laravel builds. It has not yet been extensively tested on WordPress, so please feel free to try it out and report back with any issues. Or, make a pull request! We'd love to get some community input/help to make this a better tool. 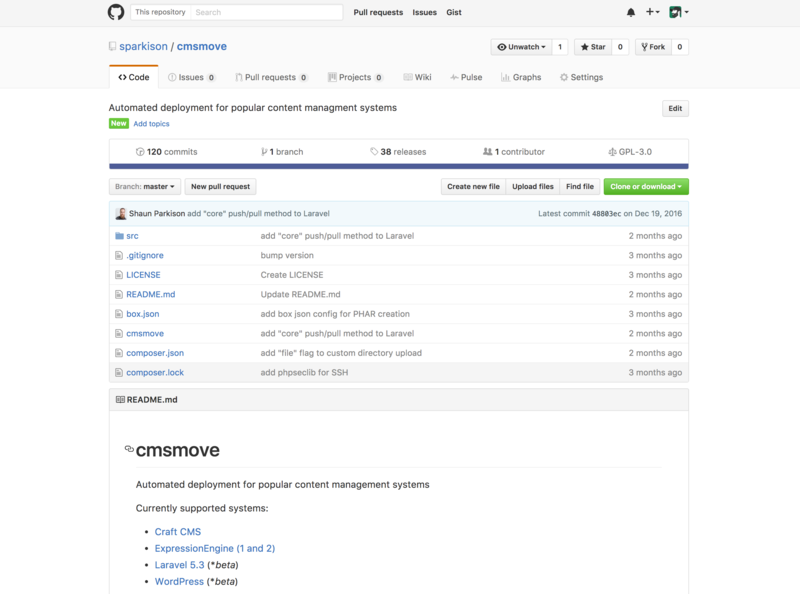 We've also made it super simple to extend, so adding your favorite CMS of choice is simple (GitHub wiki coming soon). CMS Move is built on-top of the wonderful Symphony Console Component, offering an awesome command line interface for easily issuing commands for all the tedious tasks associated with moving site files and updates around. We hope you find it useful!! Now you should see two new files created, "moveConfig.json" and "rsync.ignore". The "moveConfig.json" file is used to configure your local and remote locations, while the "rsync.ignore" file contains all of the files/directories you want to ignore during a push/pull operation. Note that each time you do a database push or pull a copy will be made of whichever environment DB is being overwritten to ensure you can rollback if needed. We have not yet implement an automated procedure for this, but that is in the roadmap! cmsmove push staging core Pushes app, www, config, database, resources, routes, and vendor folders, all in one go! cmsmove push staging database Will pull down a backup of the staging database, gzip it up and store it locally in the project "db_backups" folder, push the local database up to staging and then import it. We'd love to hear your input to help make this a better tool for all! Feel free to let us know how this works for you, or if it doesn't. What could be better, etc.